* A higher neighboring lot that cause water to flow onto your lot? 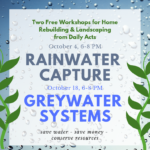 * Rainy-season drainage problems on your lot? * Adding enough replacement soil to your lot? * Who is going to do all of the above? (b) water from OTHER lots does not go onto the lot being checked. Contrary to rumor, the big builders ARE thinking about this — they HAVE to. The prohibition against water flowing from one lot to another is actually in the building code! What actually happens is more than just “checking”. If there are drainage problems a civil engineer will design a drainage system that fixes the problems. 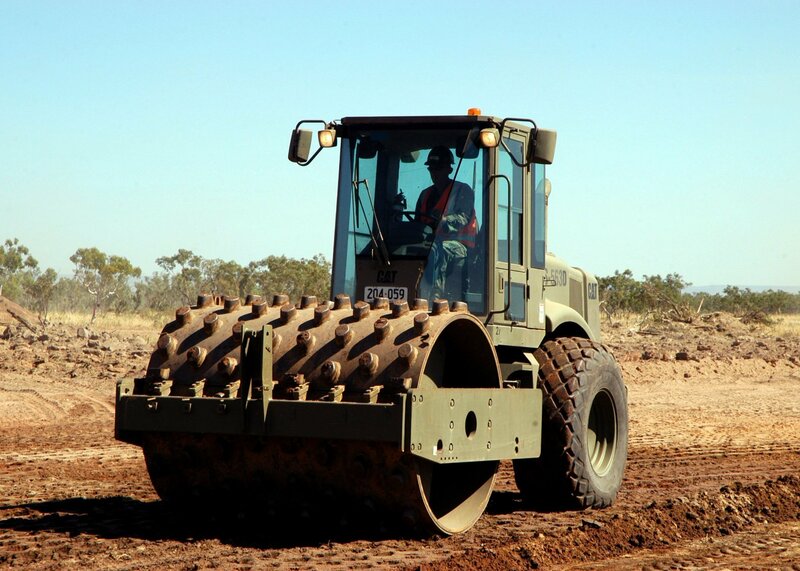 This can include adding or removing soil, adding new underground pipes and surface drains, and changing the slope of the surface (by grading). 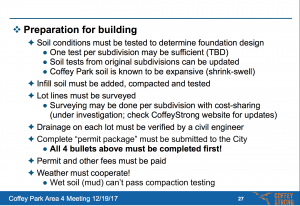 The finished design appears on a page called the “Grading & Drainage Plan” in the final “permit package” that the builder must submit to the City for approval. Just like with drainage, adding soil isn’t as simple as it sounds and requires work by a civil engineer. Consider that if you have a typical 5,000 square-foot lot that has had 3″ of soil removed over the entire lot, that’s 8.7 cubic yards of soil — which is about 2/3 the capacity of an average commercial dump truck! 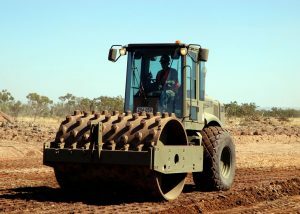 “Compaction” is like stomping on the soil to remove air and voids like you do after digging a hole, except that with clay soil like in Coffey Park it’s typically done with a piece of equipment called a “sheepsfoot roller”. Then compaction testing ensures that the soil has been compacted enough to support the weight of the foundation and house. Also note that wet soil (“mud”) can’t be tested for compaction, so the weather must be factored into this process. Many large builders will include infill , drainage and grading in their package, but smaller or custom builders might not. 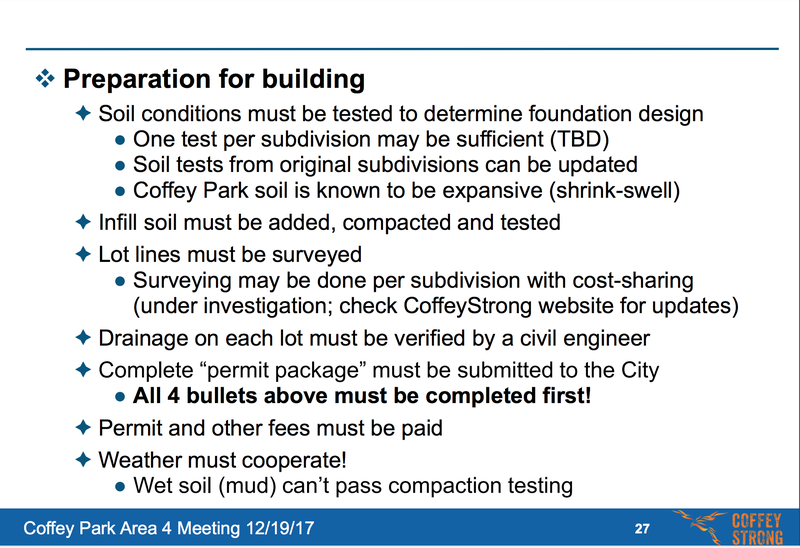 The whole “adding soil during construction” process is something that can’t be done by homeowners, so any talk about “sharing costs” doesn’t actually make sense when it comes to adding soil. What homeowners SHOULD do is (a) make sure that their builder’s plans reflect the homeowner’s specific desires before the builder submits them to the City, and (b) monitor what’s being done during the “preparation for building” phase (see pages 25-29 in the Area-4 meeting presentation) to make sure that visually obvious problems such as height differences between lots are being corrected. It may be obvious, but correcting height differences between lots typically requires grading across multiple lots. This means that if even if you already have selected your builder/contractor and you’re highly focused on rebuilding your house, you still may need to cooperate closely with the owners of the lots surrounding yours. 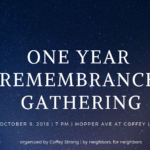 Networking with your neighbors through CoffeyStrong, Nextdoor and Facebook has never been more important! Soft costs – are they included in the builder’s cost per square foot? “Preparation for building” costs such as geotechnical (soil) testing, infill soil, drainage design, and lot-line surveying are often called “soft costs” because they’re not a direct (“hard”) construction cost. Soft costs are often included in the builder’s cost-per-square-foot quote, but not always. For example, take a look at the “Large Builder Matrix” on the CoffeyStrong website. Six of the seven builders shown in the table include soft costs, but one doesn’t. Make sure you ask your builder to explain in detail (in advance!) any and all costs that are not included in his cost-per-square-foot quote. I’m fairly sure that the majority of you have never had to deal with construction at this level before, and it can be pretty intimidating. Just be thankful that you live in the Internet age! Google and Wikipedia are your new best friends. To protect your interests when dealing with builders, it’s really helpful to increase your understanding of construction terms. I suggest Googling and/or looking in Wikipedia for all the construction terms used above: drainage, civil engineer, building code, soil compaction, sheepsfoot roller, foundation types, grading land, geotechnical engineering, surveying lot lines, and soft costs. Happy reading!